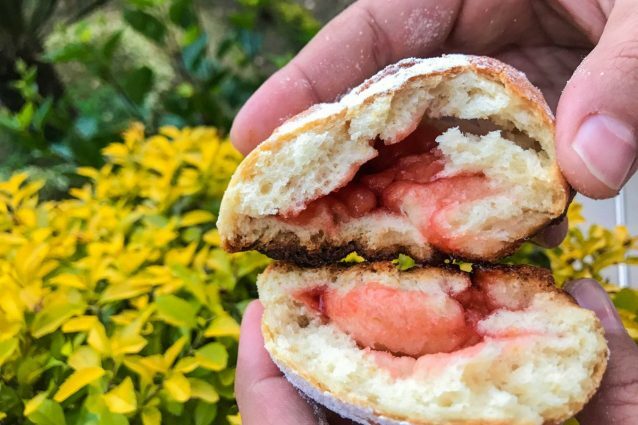 Buchteln Buns: The yummiest jam filled buns ever! You would instantly fall in love with these yummiest sweet buns that are really easy to make. Though, the recipe requires some time to get the correct fermented stage, which gives it a nice soft and spongy texture upon baking. However, as the steps to prepare this is quite simple, you will not find it to be too much of a work. So, wait no more and get started to enjoy some hot buns with your next evening tea! Mix yeast in the warm milk and keep it aside for 10 to 15 minutes or until this mixture becomes a bit foamy. Crack open the egg in another bowl. To it, add 4 tablespoons of melted butter, powdered white sugar, salt, vanilla, and the yeast mixture. Whisk all the ingredients until well combined. Add the flour to this mixture and then knead it in to a soft and smooth dough. Cover the dough and let it rise for about 2 hours. Now, lightly knead the dough and then divide it in to 8 equal parts. Flatten the dough balls on a clean surface, more around the edges and slightly at the center. Equally put the jam at the center of the dough balls. Gather the dough from the edges and then roughly roll it in to a ball. Dip each ball in the remaining melted butter and then place it in a bowl or a lined baking tray to rise again, for an hour. Now, bake the dough balls in the oven at 180 degrees C for about 20 to 25 minutes or until the buns are golden brown in color. Cool and then dust with icing sugar. Serve and enjoy! Make sure that the egg is free from any egg shell when you break the eggs. 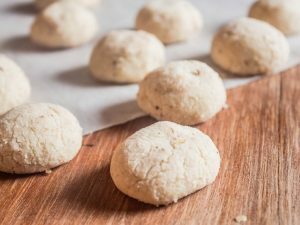 Polvorones: This is the easiest and yummiest cookie recipe ever! 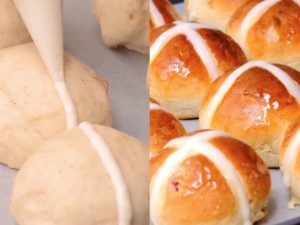 Hot cross buns: the original recipe to make them fluffy and tasty!